Writing about English Heritage’s new Quadriga Gallery a few weeks back got me reading more about quadrigas. After all, they adorn some of the most iconic monuments around the World, not just the Wellington Arch in London. 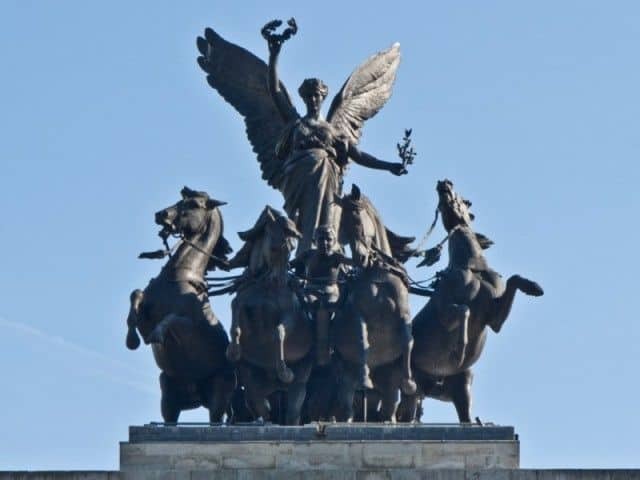 Like so many of the powerful features we repeatedly see on our cityscapes today, the quadriga looks back to the Classical World for its origins and symbolic significance. Quadriga, tethrippon in ancient Greek, comes from the latin for four (quad) and yoke (iugum), and was applied to a chariot pulled by four horses abreast of one another. It was used in chariot races by the Greeks, Roman and Byzantines. In ancient Greece chariot racing was a popular sport at their Olympic Games and other contests. 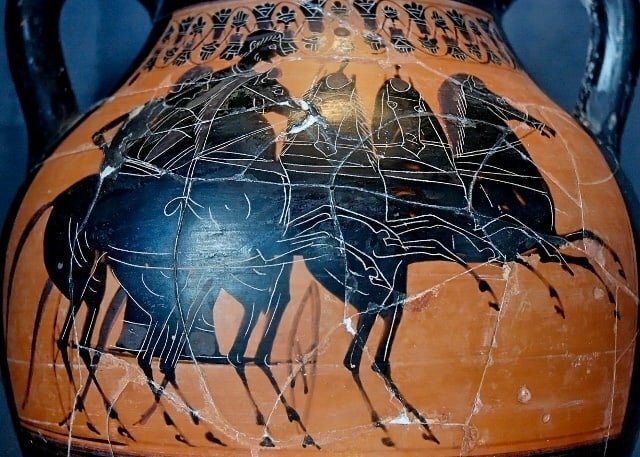 Chariot racing features prominently in Archaic and Classical periods of ancient Greek art. In some instances these are representations of chariot races in the real world. There are, however, representations that are more mythological: they depict the chariot being driven by gods or heroes. Apollo, often recognised as the god of light and the sun, is often depicted driving his chariot across the sky – banishing the darkness of the night and bringing daylight. Apollo is also regarded as the god of truth and health. Chariot racing was the principal equestrian sport in the Roman circus. In their earlier days, teams would be sponsored by wealthy backers, and as was often the case wealth lay in the hands of the political classes. Not surprisingly, the races became politicised, and Roman and Byzantine emperors took control of the races. Chariot racing was a popular sport, and successful charioteers were highly paid and achieved what we today would recognise as celebrity status. The sport was frequently depicted in mosaic pavements and bas reliefs of prominent monuments. 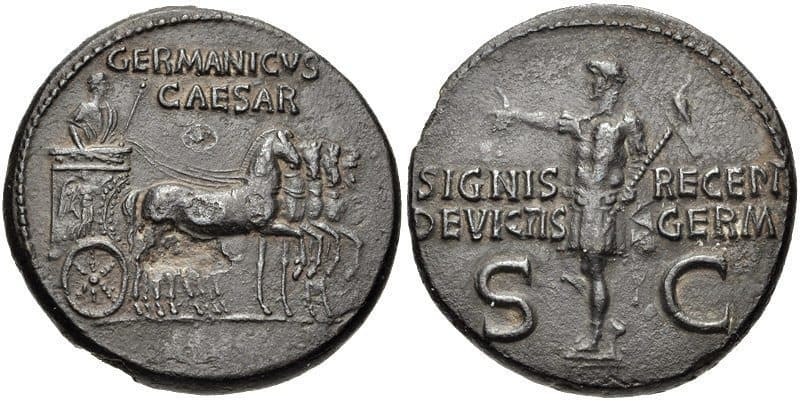 As the quadriga became a powerful symbol of triumph and victory, images of emperors, as well as other political figures, driving a chariot were frequently included on coins. Germanicus Julius Caesar, a prominent general in the early Roman Empire, who was also popular because of his successful commanding of the army in Germania. Below, Germanicus’ victories are celebrated on a Roman coin thought to be struck under Gaius between AD 37-41. With this all to brief history, it becomes clear why grand sculptures of quadrigas have continued to be chosen up until more recent times. The quadriga photographed at the top of this article is sited on top of the Arc de Triomphe du Carrousel in Paris. The theme of triumph is reiterated in the arch, which is an architectural feature that is modeled on the triumphal arches of Rome. The triumph being commemorated here in Paris are Napoleon’s military victories in 1805. And it was Britain’s victories in the Napoleonic Wars that were celebrated in Wellingtons Arch in London (below). On both of these arches the highly symbolic triumphal chariot pulled by four horses is driven by an angel of peace. The angel of peace driving a quadriga on Wellingtons Arch in London. Quadrigas can be found all over the World, Berlin, Detroit, Dresden, Munich, New York and Saint Petersburg, to name just a few. In each city these sculptures may have been put there for different reasons, at very different times, but each draws on a tradition that goes back thousands of years. The archaeology of ancient Greece and Rome is not neatly confined to their respective periods, they are a significant part of our lives today. And quaint features such as sculptures of a horse drawn chariot, have prominent positions in our streets are constant reminders of this.